Do our brains pay a price for GPS? When I moved to Boston in 2011, I took public transportation to work. A couple years later, a friend lent me his car while he was out of town, and for the first time in my life I became a guy who drove to the office. Parking in the employee lot came naturally enough; so did listening to “Morning Edition” and balancing my coffee in the cup-holder. Actually navigating the streets of Cambridge and Boston, however — that part was less intuitive. So I did what any rational, 21st-century person would do in my situation: punched my work address into my smartphone and listened as a GPS-powered, step-by-step guide told me exactly what to do. Turn left in 300 feet, take the second exit out of the rotary, and so on. This I could handle. Before I knew it, my destination was on my right. After a few days, I grew confident, and one morning decided to find my own way. But as I tried frantically to remember the GPS’s instructions, I realized that despite multiple trips to and from work, I had learned exactly nothing about the city’s geography. As I sat at a red light, I didn’t have the foggiest notion of where I was relative to where I’d come from — or, more importantly, where I was trying to go. My first instinct was to turn the GPS back on so I could stop being lost. My second was to wonder what, exactly, its handy instructions had done to my mind. How could I have followed all those steps, and made all those turns, without retaining anything? How GPS affects our natural ability to navigate is a question that has, in recent years, begun to attract the attention of researchers around the world. What they are finding suggests that my experience was not just one novice commuter’s blind spot: Instead, I was one of millions of people for whom technology is disrupting something the human brain is supposed to do well. When we use GPS, the research indicates, we remember less about the places we go, and put less work into generating our own internal picture of the world. The research doesn’t necessarily mean we should all chuck our beloved devices out the window. But it’s a strong case for not giving up our old-fashioned maps and human-style directions — turn right at the Dunkin’ Donuts and keep the river on your left — just yet. And it may also offer us an idea for how to reengineer this immensely popular technology itself, so that instead of competing with our astonishing ability at mental mapping, our gadgets actually begin to support it. When GPS devices first started showing up in luxury cars during the mid- to late 1990s, it was like something out of science fiction. Never again would people have to make wild guesses about the next turn, or last-minute decisions about exiting the highway. Instead, a soothing voice would just tell you what to do, patiently laying it out in simple, incremental steps. This was not just a new way to drive — it was a revolutionary advance in the way we approached the task of orienting ourselves in the world. Historically, humans always had to work hard (if largely unconsciously) at this problem, paying close attention to their surroundings and assembling pictures in their heads that were populated with an array of landmarks, roads, intersections, and boundaries that, in sum, helped them figure out how to get where they wanted to go. One particular advantage of building these mental maps is that they allow people to be spontaneous and flexible in how they get around: “If all you know is, ‘I have to turn left at the church, then right at McDonald’s,’ then you can reproduce the route, but you are not able to very flexibly navigate from Point A to Point B,” said Frankenstein. That means you can never deviate from the route you know, look for shortcuts, or improvise if the situation calls for it. 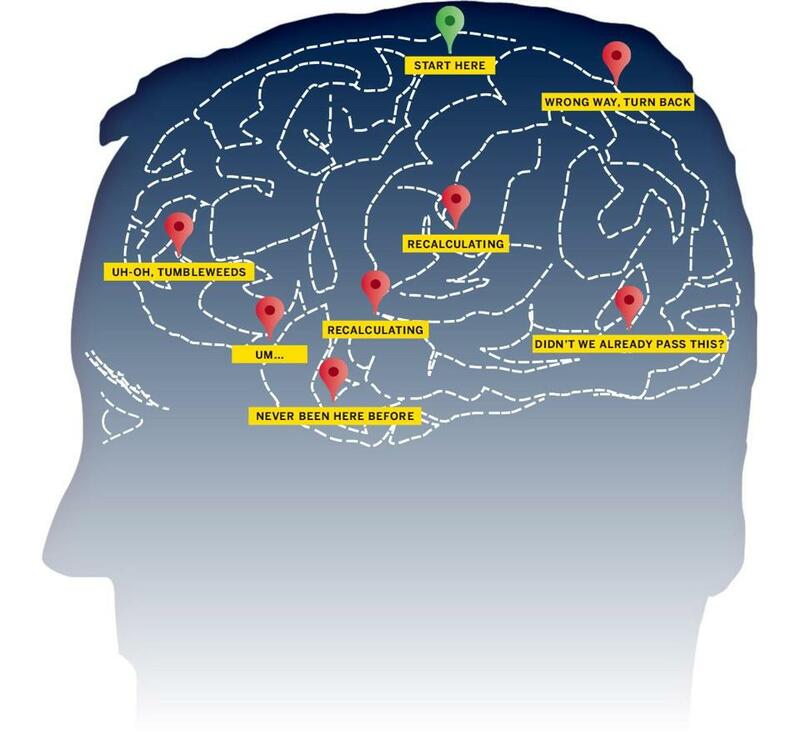 With the arrival of personal GPS devices in cars or phones, the tough cognitive work involved in mental mapping was suddenly rendered less necessary. Gary Burnett, an associate professor in the engineering department at the University of Nottingham in England, wanted to know what effect that actually had on people’s ability to navigate. In 2005, he set up an experiment using a driving simulator in which test subjects were asked to complete a set of four routes. Half of them were given step-by-step instructions that guided them right to their destination, while the other half were given traditional paper maps. Afterward they were quizzed on what they’d seen, and asked to sketch a rough map of their route. The drivers who had merely followed instructions did significantly worse on all fronts. They even failed to recognize that they’d been led past certain places twice from different angles. What GPS was doing, in other words, was letting people just pass their surroundings by, instead of assembling a picture of where they’d been. Other researchers have generated results that support Burnett’s findings. A 2008 study led by University of Tokyo geographer Toru Ishikawa found that people asked to reach a destination on foot drew less accurate maps of their routes when they were assisted by GPS than when they weren’t. Two years later, Ginette Wessel, then a PhD student at the University of California, Berkeley, reported similar results at a conference on visual interfaces. More recently, a study by Stefan Münzer of the University of Mannheim in Germany found that while people following the kind of “egocentric” cues generated by GPS devices — where the map is constantly reorienting itself to put the user in the center of the universe — made fewer mistakes on the way to their destinations than people who used traditional maps, they didn’t remember as much about the landmarks they’d walked past to get there. Bohbot, the McGill neuroscientist, started experimenting with navigation because of an interest in the way people’s brains change as a result of learning. Bohbot developed a method for using fMRI technology to distinguish between people who tended to find their way by going through a memorized list of step-by-step directions — what she calls “stimulus response strategy” — and those who were inclined to orient themselves by conjuring a mental map of the world around them. People who just follow directions, Bohbot found, tended to have less gray matter in their hippocampus, the part of the brain responsible for encoding spatial memories. People whose everyday work is deeply dependent on mental mapping can show brain development that is particularly distinctive. A famous study published in 2000 by British neuroscientist Eleanor Maguire showed that taxi drivers in London with years of experience navigating the city’s complex geography had more gray matter in the posterior hippocampus compared to people who were not taxi drivers. The study underscores that how our brain works is subject to use; the brain is plastic, and the more mental mapping we do, the stronger our cognitive navigation skills and the bigger the part of the brain that encodes them. While there’s nothing inherently good about having a big hippocampus, researchers have discovered that people with smaller ones are at higher risk for a range of serious psychiatric disorders, including dementia, schizophrenia, and PTSD. And while Bohbot cautions against concluding that GPS actually puts you at risk for mental decline — there is no study that has ever shown that, she points out — she herself has given up the device. For some people, the prospect of reclaiming that richness is not enticing enough to justify the pain of constantly getting lost. The good news is that the tradeoff might not be so cut and dried. According to a study conducted by one of Gary Burnett’s students, a set of step-by-step driving instructions that explains what to do in terms of real-world landmarks — the supermarket, the bridge, the river — might actually help with the construction of mental maps, rather than hurting our ability to create them. GPS could also help by allowing us to go explore our surroundings without the risk of getting seriously lost. Sitting at my desk the day of my humbling morning commute, I studied a map of the city, absorbing what was where, and trying hard to understand what to do, rather than just memorize a list of commands. That evening, as I drove down the Pike, my window down and my phone buried deep in my pants pocket, the city snapped into shape around me. Suddenly I was not just a guy who had learned a set of moves. I was a guy who knew his way.